Dear friend, I am so glad that you could come over today and spend a little time with me. I have my cup of coffee and I am ready to visit with you. I have received several suggestions for topics for my Friend Fridays. Today, it seems fitting to share a devotional book with you, Take Flight! 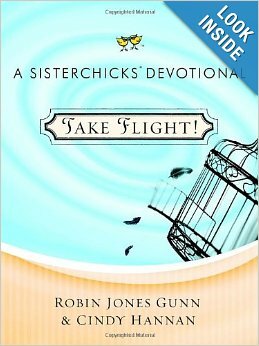 A Sisterchicks’ Devotional by Robin Jones Gunn and Cindy Hannan. These two ladies have written several Sisterchicks fiction books and decided that God was leading them to share grace stories in a devotional for women. Thus, Take Flight! was created. Each devotion starts out with a quote from a character in a Sisterchicks novel. This leads to a real life story of grace, called “From Robin’s Nest”. Cindy then shares questions, wisdom, scriptures to examine and even space for journaling in the section, “From Cindy’s Perch”. Then it ends with Sisterchickin’ Suggestions – an activity to apply what has been discussed in the devotion. I absolutely loved this part. It takes the devotion beyond observation and interpretation to applying it to your life. This short devotional would make a great gift for the “sisterchicks” in your life. Whether you have read the Sisterchicks books or not, I would highly recommend this great little book. ** Don’t forget, if you have a topic that you would like discussed on the Friend Fridays, please let me know. I am looking forward to hearing from you.